Did you manage to visit our online clinic on bladder, bowel and digestive health? If you missed it or would like to read through the questions and answers you can see all the content here. We would like to thank all the brilliant charities we teamed up with to help give you the most up to date help and support. These include- Bowel & Bladder Foundation, Core, IBS Network and Promocon. 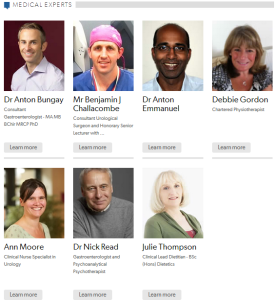 We have a big thank you to send to our medical experts who answered your questions on a range of topics. These include bed wetting, cystitis, incontinence, bowel cancer, IBS, constipation and other bowel and bladder issues. Follow our links to find out expert guidance for bedwetting with children or leaking with adults. Hear from the experts and see links to charity support around issues such as how to strengthen a weak bladder following catheterisation. Our medical experts provide personal everyday pratical advice to help with bowel movements, diarrhoea, and also more in depth advice to help those suffering with severe IBS. Many other topic questions were answered so if you have a particular issue you want to read more about visit the main clinic page here. At the same time as our online clinic on bladder, bowel and digestive health, we ran a #talkhealth twitter chat. This had sponsorship from with sponsorship from Actavis, Intrapharm and HG Medicines. Some of the charities also took part and got involved in conversations about how we can help to manage some of the symptoms associated with these conditions. To read our storify on our twitter chat click here. We hope you find both the clinic and the twitter chat useful, if you wish to please feel free to leave a comment with your thoughts! If you missed our last clinic or would like to be notified when a new clinic is due, just click on this link and we will keep you updated with when the next clinic is about to start. To follow live twitter updates sign up to @talkhealth.